If you or someone you know if physically unable to visit the Library, the Good Neighbours program, arranged in partnership with Community Care, can help! Library staff select material in accordance with a member’s personal reading preferences, and home delivery is arranged through volunteer drivers from Community Care. Anyone with a legitimate physical reason for not being able to come to the library is eligible to become a Good Neighbours member. Call Community Care at 905-623-2261 to arrange for a volunteer driver, and you can plan your first delivery date. Call the library back to arrange for your first block of materials, and you have officially started the program! How do I arrange deliveries? Can I arrange my own volunteer driver? How many items can I take out at one time? What is the loan period ? How do you know what I have read? How do you know what material to send? 1. What if I don’t have a Library card? Your volunteer driver from Community Care will bring you a card signup form during his/her first delivery. This form needs to be filled out and returned so the Library can complete the sign-up process. 2. How do I arrange deliveries? 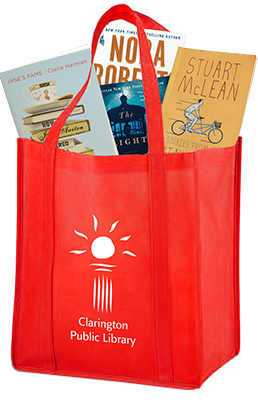 Let Library staff and your Community Care volunteer driver know that you would like to have a delivery. Please contact the Library at least one day before your preferred pick-up date to allow enough time to gather the materials. 3. Can I arrange my own volunteer driver? Yes! If you have a friend or family member who can pick up and delivery materials for you, then it’s not necessary to contact Community Care. 4. How many items can I take out at one time? This is one of the preferences the Library will ask you about during your initial interview. Most members tend to choose around two to five (2-5) items at a time. This number can easily be changed depending on your current reading practices however, so just let Library staff know the next time you contact us for new materials. 5. What is the loan period? Good Neighbours members can keep material for four (4) weeks. However, we realize that you may not always be able to arrange a delivery in a timely manner, so members do not have to pay fines. We ask for your consideration in returning your materials within a reasonable time period. 6. How do you know what I have read? The Library will keep track of the books sent to you. It is possible to run out of your preferred material, so if you don’t mind re-reading certain titles or authors, please let us know and this will be noted on your file. 7. How do you know what material to send?